CTBaker in the Acres: Let's get this Pawty Stawted!!! 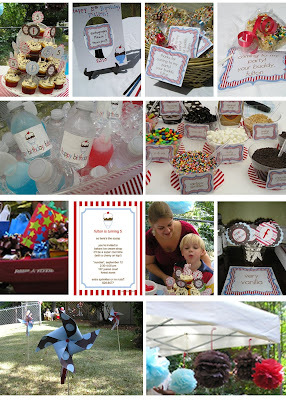 As I stated earlier...I love planning my children's parties! Fulton has requested an ice cream social. So I got my wheels turning and went to my favorite place for some inspiration...the Internet! I created my inspiration board from some other great blogs and websites. I was blessed with S and F being born right smack dab in the middle of college football season. So we either have to do parties on "off" days or Sundays. So we chose the Sunday following F's birthday. I used my Mom Agenda planning section to get me started. Left to right: cupcake tree, autograph mat (Each MM has one from every birthday. They are my favorite mementos and I hope they'll be theirs too. ), treat basket and treat, personalized water bottles and kool-aid on ice, toppings, wagon with gifts, invitation by Letter Bugz, blowing out #5, cupcake toppers and ice cream tags, paper pin wheels lining the walk to greet guests, tissue pom-poms suspended from ice cream tent. This is what we ended up with! F loved it and was so excited when he walked outside to see the staging. He said. "Wow! This is MY party!" I was very pleased with how it all came together. Beautiful party decorations! You did a great job, lots of hard work. Seriously, your blog is amazing. Exactly the kind of faith, grit, real love, and dedication that CA is missing. You are one in a million, and I am so lucky to know you. 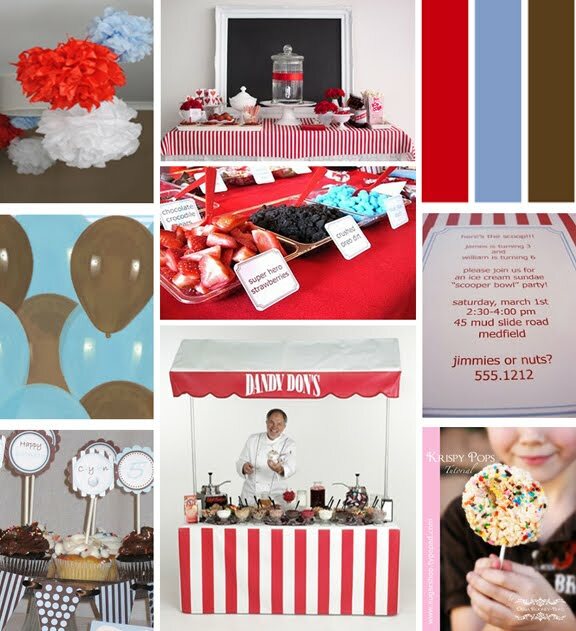 Love this post and how you came up with all of your ideas!!! That party was a huge success and the perfect thing to do on a hot Sunday afternooon. I know we had a ball!! looks like a great party! love your inspiration board!